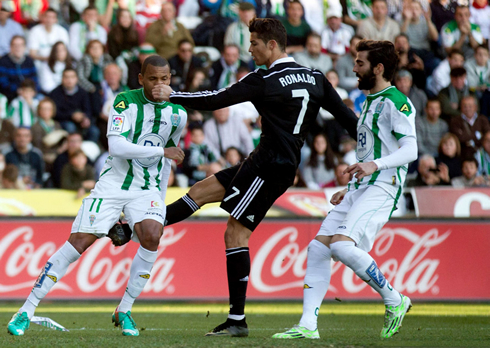 Real Madrid visited Cordoba this Saturday afternoon in another La Liga fixture, in a game where the Merengues only managed to secure the 3 points one minute before the end of the regular time. 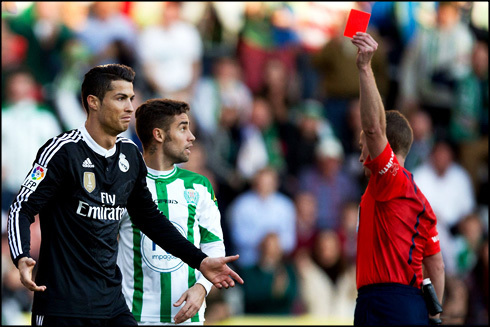 Cristiano Ronaldo got sent off with a straight red card late in the second half, which ultimately forced the goalscoring task to land on Benzema and Gareth Bale's feet. It was a bit of a changed side for Carlo Ancelotti's men, and with both Isco and Pepe sidelined due to injury, Sami Khedira and Raphael Varane ended up deputising in their absence. It was an intense high-octane match, with Cordoba determined to take the game to Madrid, just as they had in the Bernabeu earlier in the season. The Cordoba support was fantastic, giving the home team that extra boost. 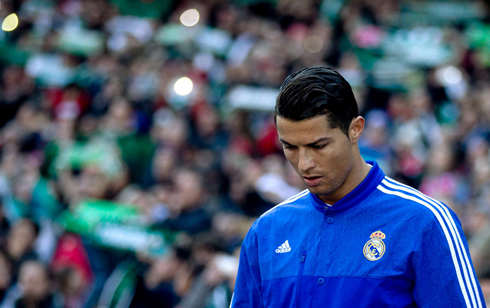 The hosts lived up to the hype, pushing Real Madrid as hard as they could for the duration of the game at the "El Arcángel". Only 57 seconds in and it already went all wrong for Madrid, as a shot cannoned off the hands of Sergio Ramos inside the penalty box. The Spaniard, who has become even more error prone (even by his standards) in the past few weeks, claimed innocence, but the proof was there for all to see. Algerian forward Nabil Ghilas, took a slow run up and placed the ball into Iker Casillas' left top corner to make 1-0 for the hosts. Saint Iker chose correctly, but he had no chance of stopping the well placed penalty. The goal seemed to push Real Madrid into high gear and after a slew of set piece opportunities, they would eventually go level from a scrappy play in the box. In the 27th minute, Karim Benzema picked up the loose ball after a helter-skelter in the six yard box where Gareth Bale got a slight touch on the ball and the Frenchman slotted it home from close range. Things wouldn't get much better in the second half. Real Madrid would keep trying, but Cordoba repeatedly kept the Merengues on edge, while stifling any chance of a Madrid comeback. And they would almost go ahead in the 69th, after an error from Varane freed up Florin Andone. However, his lob over Iker Casillas would bounce off the crossbar, with Sergio Ramos and Dani Carvajal scampering back hopelessly. 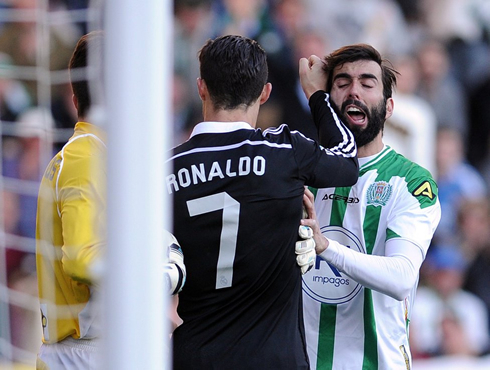 Things would go from bad to worse in the 84th minute, after Cristiano Ronaldo, a frustrated figure all game long, lashed out with a slap and a kick on Edimar. He was immediately sent off for his actions and deservedly so, in what was a poor show from the reigning World Player of the Year. But in the 87th minute, Madrid's blushes would be spared as a Gareth Bale freekick clattered off of the hand of Fede Cartabia's outstretched hand inside the box. With Ronaldo off, it was Bale stepping up to take the penalty and the Welshman made no mistake from the spot. A difficult escape for Madrid, but as they say, these are the matches that can be worth championships. 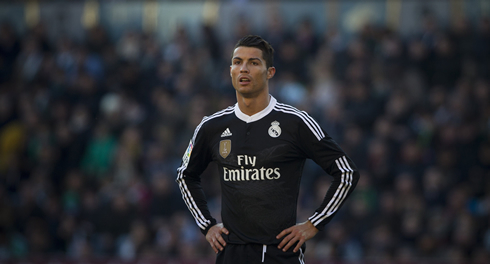 Cristiano Ronaldo next game will be for La Liga against Real Sociedad, on the 31st of January of 2015. You can watch Juventus live stream, the Real Madrid vs Real Sociedad, Atletico Madrid vs Barcelona, Bristol City vs West Ham, Brighton vs Arsenal, and Aston Villa vs Bournemouth, all matches provided from our steaming football game pages.